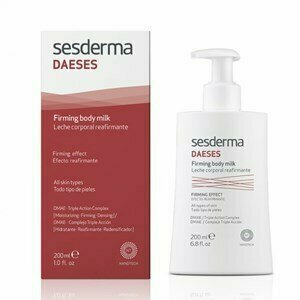 Daeses firming body milk, is the ideal treatment for the prevention of and fight against flaccidity. As we age, the levels of acetylcholine, a chemical mediator related to the muscle tone, are diminished. The DMAE contained in Daeses line, increases the release of acetylcholine, which sends signals from the nerves to the muscles and nerves. Therefore, since it stimulates the production of acetylcholine, the muscle tone is increased, as well as cutaneous firmness. It has an immediate lifting effect. Hyaluronic Acid, a natural substance that allows long duration of superficial hydration, protecting the skin from external aggressions. Especially suited to help in the prevention and treatment of body flaccidity, caused by factors such as weight loss, aging, sun exposure and after pregnancy. After the application, your skin will feel firmer, more tense, more elastic and hydrated. Apply the product on clean and dry skin , especially in regions known as more flacid like the arms, torso, stomach and thighs. Gently massage in a circular motion, until the product is completely absorbed.